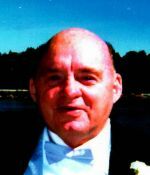 Obituary - Robert J. Moran - Bentz Funeral Service, Inc. In lieu of flowers, kindly consider contributions in Bob’s memory to the Alzheimer’s Association of CNY. Robert J. Moran, 84, of Clinton, passed away on Wednesday, April 3, 2019 at the Lutheran Home. He was born December 8, 1934 in Utica, the son of the late Robert B. and Collette Kirshner Moran and was a graduate of New Hartford High School. Mr. Moran was a US Navy veteran of the Korean War. On October 4, 1986, in Utica, he married Helen Mechanye Bause. For many years, he worked at the Val Bialas ski area for the City of Utica. He later worked as a machinist for 31 years at Chicago Pneumatic, retiring in 1994. Mr. Moran was a parishioner of the Church of the Annunciation in Clark Mills, was a proud Navy reservist for many years and was a member of the Utica Moose Lodge, the Fraternal Order of Eagles and the American Legion Post #229. Bob enjoyed playing bingo, cards, lottery tickets, candy and loved to dance. He is survived by his wife, Helen; two children, Edward P. Moran of Utica and Deborah (Joseph) Varin of Cassville; four stepchildren, Robert (Marilynn) Bause of Naples, FL, Richard Bause of Utica, Joseph (Kirsten) Bause of Las Vegas, NV and Cynthia Weber of Cicero; one brother, Edward "Ted" Moran of Alder Creek; eleven grandchildren, Edward, Robert and Breanna Moran, Brittany DePasquale, John and Melissa Synek, Charis and Caleb Bause, Zachary Bause and Nathan and Nicholas Weber; brothers-in-law, Greg Lasek and Ken Schmoke; sister-in-law, Nancy (Ken) Britt; and several nieces and nephews. He was predeceased by his parents; his brother, William Moran; and his sister, Patti Lasek. Relatives and friends are invited to attend his Mass of Christian Burial which will be celebrated on Tuesday at 10:30 am at the Church of the Annunciation in Clark Mills. Interment with Navy Honors will follow in Forest Hill Cemetery in Utica. In lieu of flowers, kindly consider contributions in Bob's memory to the Alzheimer's Association of CNY. The family wishes to thank the staff of Valley Crest (Lutheran Home) for Robert's care. Arrangements are with the Bentz Funeral Service, Inc., New Hartford. Helen and family, I am sorry for your loss. Bob will remain in our hearts and memories. I remember how he would greet me with a welcoming warm genuine smile, I will always remember his laughter.